For most people, their jewellery has a considerable amount of sentimental value, not to mention the mere monetary value. People have pieces of jewellery that they not only enjoy wearing themselves, but may be thinking about passing down to the next generation. They may even have items which have been passed down through several generations. If you are planning an upcoming move, or are looking to get some of your jewellery stored away long term, below are some tips for packing to make sure everything remains safe and sound. The biggest difficulty in packing necklaces and bracelets is that the chains and loose pieces can easily get tangled and, if moved the wrong way, can actually break, or cause other pieces of jewellery to break. The best way to secure the chains is by threading them through drinking straws, paper towel or toilet paper rolls. 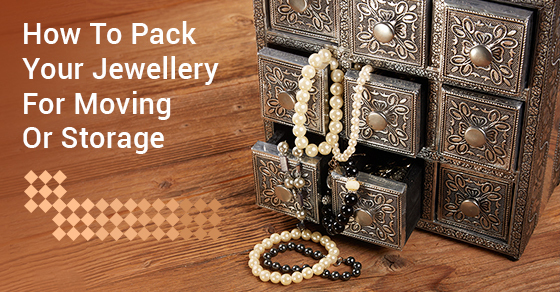 After the chains have been secured, you can wrap the piece of jewellery in its entirety with wrapping or tissue paper. The best way to ensure that your jewellery box doesn’t become a chaos of tangled up earrings is to secure them with some sort of backing, usually cardboard. Simply poke holes in the cardboard and insert the pointed end of the earrings through the holes. They can now be safely transported without getting everything all tangled up. Pill organizers are also another excellent way to prevent a birds nest of earrings from forming during transportation. Securing rings while travelling is a must. One of the best ways to make sure that you aren’t opening up a box full of scattered rings after your jewellery has been in storage or transportation, is to place them in egg cartons. This will help to keep them separated, as well as secure. You can also place them in a hard sunglasses case, protecting and securing them. If you are hiring a moving company to help you move, or placing your jewellery in storage for the long term it is a good idea to make sure that everything is locked away. Thieves exist and while the majority of the people you are going to encounter who work at self-storage facilities or for moving companies are hard working, honest people, thieves have a way of slipping through the cracks. Don’t make it tempting for someone with sticky fingers to rip you off. Keep your valuables stowed away and locked up. You want to make sure that your jewellery stays in the family and is not lost, stolen or damaged while being transported or not in use. This is entirely within your power. Keep the above storage and transportation tips in mind and ensure that your jewellery is intact and where you left it for when you need it next.